Little Wonder leaf and debris vacuums clear and collect all types of debris - large and small; bottles, cans, leaves, pine needles, straw, gravel, and other debris that would normally have to be swept up by hand. This vacuum has superior suction and airflow, the result of our industry-leading impeller housing design. Our design funnels airflow and material down into the bag, filling the bag completely without loss of suction. The top-loading bag boasts a hefty 74.47 gallon capacity - TWICE that of the competition. You'll collect more debris per bag and spend less time emptying it. 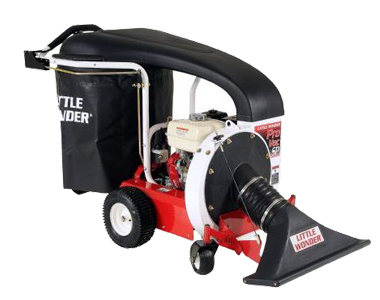 Excellent for residential cleanup, industrial applications, commercial sites and parking lots.